Once again, and just in time for Father’s Day, I’m the proud dad of another healthy bouncing baby website. We launched this one last week for a couple of wonderful people that I had dinner with back in April. 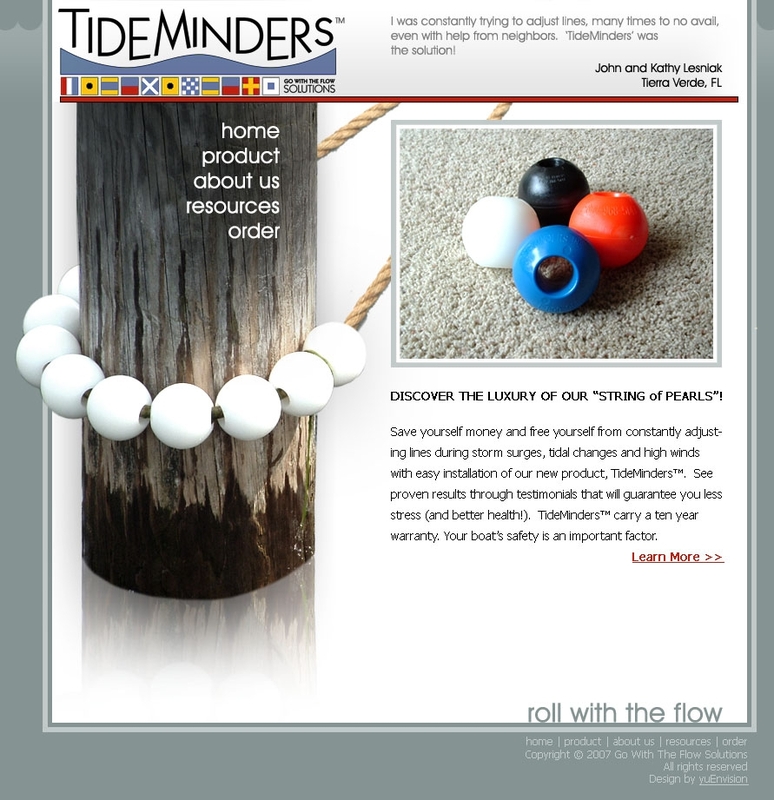 They have designed and developed a product called TideMinders, a device that is placed on your boat lines so that as the tide changes and your lines go up and down on the pilings, they don’t wear out. Ingenious! For those of you who don’t know, we bought a house. We’re really excited about it and are glad to be home-owners again. Granted, it’s a lot of work, but we are incredibly blessed with very good friends who are extremely loving and talented. Here’s what I mean: We closed on the house on a Friday. The following Saturday, several friends came to help us get the house ready for work. We decided to completely gut, redesign and have the kitchen rebuilt before we move in. So, on Saturday morning ten people showed up to help demo the kitchen (that’s “demolish” not “demonstrate”) and assist us with various surgeries that were required around the house: tearing up carpet, running grounded electrical, putting electric outlets into the sunroom, pick up fallen branches, dig up scrubby shrubs, edge, mow and basically turn the place inside out in a day. For the kitchen, we ended up going with dark cherry cabinets with chrome hardware all around (lighting, faucet, sink, handles, etc). The counter-tops and flooring are a textured light-beige. The jewel of the kitchen will be the glass-tiled back-splash that reflects the under-cabinetry lighting. The following week, my dear friend, McKeel, began work on rebuilding the kitchen and installing the new materials while a couple other dear friends, Matt and Ben, began tearing down doors and sanding all of the trim throughout the house to prepare everything for priming and painting. Why, you may ask, are my friends doing all this work and I am doing nothing? If you’ve not read the stories about Me and My Yard, then you don’t know how completely inept I am when it comes to things that aren’t computer or graphics-related. I have the propensity to mess up the simplest of tasks. That’s not to say my wife doesn’t support me or believe in my ability to succeed… that is a testimony to the fact that we have both seen me in action. When I work on the house, it qualifies as entertainment for the neighborhood. I’m told that when you buy a house, you should change the locks on the doors. How hard could that possibly be? I mean, really… what could possibly go wrong? Another dear friend, Adam, had been so excited to work with me on a project on my new house that we were both giddy at the opportunity to work on something together. One evening, we grabbed his tools (for I have none of my own) and ran over to the house to start putting in new locks. The house was built in 1955 and the front door, we suspect, is original to the house. it’s a very cool design and we really like how the windows are laid out… it just needs some updated hardware to bring it up-to-date. Unfortunately, hardware standards change over time and the holes that were bored into the door for the original handles were only about 1.5 inches, vs today’s standard of 2 1/8 inches. That means you have to use a hole saw to bore a bigger hole. I had to ask McKeel because I didn’t know. He was very kind. I am very ignorant. To drill a bigger hole into a door, you have to cut a wooden shim to fill the existing hole so you can start a pilot hole. Here’s the part we missed: you have to measure correctly where the pilot hole starts so you get the bigger hole in the right place. I now have two 2 1/8″ holes cut right next to each other in the form of what most people would call an oval. I call it a peep-hole for spotting Hobbits and small children. I have never seen a door with a hole cut in it that was too wide for the doorknob. He was very kind: “It’s not that bad. I can probably come over sometime and fill it with wood putty or cut a patch and match it to the grain. No one will ever see it.” Note that he did not say, “no one will ever know.” I expect he’ll be telling people about this for years to come.